When British producers Ricky Simmonds and Steve Jones joined together to form Lustral, they started a partnership that would last for over 15 years. Banking on genuine musicality and inspired concepts, the duo saw club and chart success with their very first record, ‘Everytime’, featuring Tracy Ackerman. That was in 1997 and since then the duo have produced various tracks under other aliases. The album delivers heartfelt songs delivered by vocalists, writers, and musicians and at times, ‘Empathy’ feels more like a pop record than dance, which highlights the various sounds on the album. When the beat kicks back in, you remember listening to the first Lustral record so many years ago on Hooj Choons, and knowing then that these guys had the staying power to achieve a long and fruitful career. The vocals on this album are provided by Ricky Simmonds, Abigail Bailey, and Laura Jenkins, and the blending of the talents of these performers is immediately apparent. From spacey grooves on ‘When My Satellite Falls Down’, to the driving trance of ‘I Can’t Wait’, to the pop prowess of ‘I Feel You’, there’s a massive spectrum of sounds and concepts here. 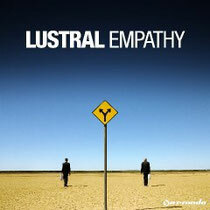 It’s out now on Armada and for those who’ve been tracking Lustral for a while, this album will be as new as it will be coming round full circle to where it all began. Check the mini mix below.